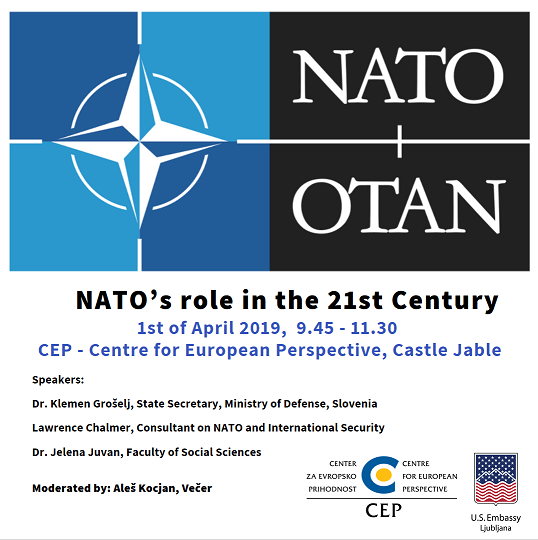 Centre for European Perspective (CEP) kindly invites you to a round-table discussion on 1st of April at 9.45. Slovenia is celebrating the 70th Anniversary of the signing of the North Atlantic Treaty and 15th Anniversary of Slovenian membership in the Alliance. Seven decades ago twelve countries from both sides of the Atlantic signed an agreement in Washington, seeking to promote stability and well-being in the North Atlantic area. They committed to fostering peaceful and friendly relations between members and beyond. The North Atlantic Alliance was founded on the principles of democracy, individual liberty and the rule of law, it remains the backbone of our collective defence. After 70 years it still embodies the transatlantic link that binds North America and Europe in a unique defence and security partnership. NATO has experienced many challenges on its path from rebuilding of Europe after the WW II, the Cold War era, the fall of the Berlin Wall, the attacks of 9/11 and the so far only instance of Article 5 activation. At 70 year anniversary we would like to reflect on the path traveled and on the future of NATO alliance. The round-table will discuss the role of NATO in our region, particularly in light of changes in our security environment as well as the importance of the transatlantic alliance. How will the alliance, which has overcome historic divisions and became the most successful alliance in history, overcome internal and external challenges? What will the NATO alliance look like in the 21st century? What is the future of NATO in the Western Balkans? Please RSVP by 28 March via Application.